I found a scrap of waterproof fabric in the material shop for ¥100, usually this stuff is really expensive so it was a bit of a find. 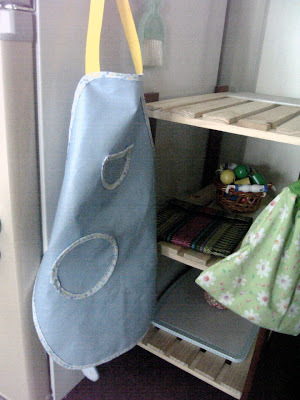 I figured there was just enough to make BabyEbi an apron. 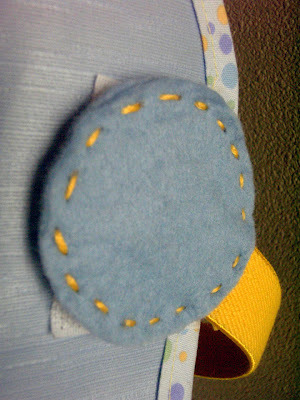 He already has a little cloth one that I bought, which was also a bargain at ¥50 but he can't put it on by himself. So, along with the fabric I got some really pretty bias binding and some elasticated stuff for the straps. Now he can just pull it on over his head, I used a big patch of velcro and made it into a BIG tab on end of the strap so he can fasten it easily, it took him a couple of attempts to pass the strap round his back but he got the hang of it eventually. 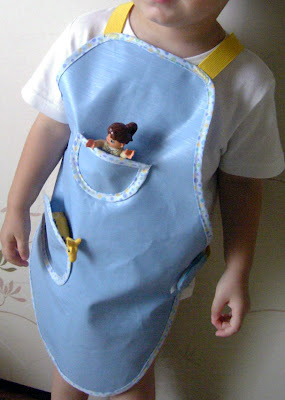 BabyEbi loves his new apron and decided he really MUST wear it even when playing with his Lego. The BIG tab, I was going to use some of the material scraps to make the tab, but my every-so-helpful hubby chucked them out, thinking it was rubbish!! 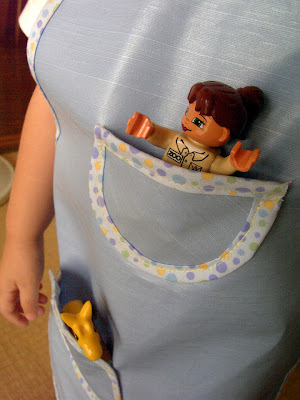 And a couple of cute pockets, just the right size for Lego people and giraffes. I have also finished the major project that I have been working on - the sound pouches, yes, I insanely hand sewed all 26! But they are super cute. I have got to put the objects in yet, we will do that together today, looks like it is going to be another hot one. Roll on the autumn, that's what I say!